The CAT engine with the avionics, power system, propellant tank, magnetic nozzle, plasma discharge chamber, and solar panels. (Phys.org) —Two University of Michigan engineering professors are turning to the Kickstarter online community to help fund an interplanetary satellite mission. They are teaming up to create two new technologies in a matter of months, with the goal of using a plasma thruster to push a CubeSat into deep space – something that has never been done before. "We're using Kickstarter to develop a new miniature thruster technology to mount on CubeSats, a small spacecraft that is about the size of a loaf of bread. We'll use this new thruster to escape Earth's orbit and send them into interplanetary space," said Benjamin Longmier, assistant professor of aerospace engineering and a propulsion specialist in the Plasmadynamics and Electric Propulsion Lab (PEPL) in the College of Engineering. 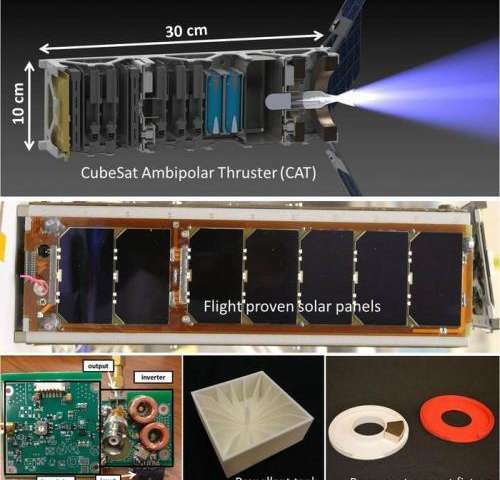 The thruster, which would use superheated plasma directed through a magnetic field to propel the CubeSat, would be the first of its kind, he said. With this technology, exploring interplanetary space and eventually other planets would become faster and cheaper than ever before. Longmier's partner on the project is James Cutler, assistant professor of aerospace engineering and director of the Michigan Exploration Laboratory (MXL), where the CubeSats have been designed, built and launched since 2008. To date, Cutler's team has launched three CubeSats into orbit. "The problem with the spacecraft we currently build is they don't move," Cutler said. "And there are some very interesting places that we'd like to go. So Ben's come along and hopefully we can combine these two efforts and go to some very interesting places." To accomplish this, the CubeSats first need to be adapted to survive outside of the protective sphere of Earth's magnetic field and withstand the harsh environment of interplanetary space. Cutler's team has been selected by the Jet Propulsion Laboratory (JPL) to be part of the Interplanetary NanoSpacecraft Pathfinder In Relevant Environment (INSPIRE) mission team, which aims to demonstrate survivability, communication, tracking and payload hosting with two CubeSats dropped off in deep space by a larger rocket. This project will help with the development of the CubeSat for interplanetary exploration, but still the satellites have no means to be propelled by themselves and no planned destination. "That propulsion system is in many ways the limiting factor for our spacecraft," Cutler said. That's where Longmier's technology comes in. Longmier's propulsion design possesses two very different characteristics from current propulsion systems. For one, it's tiny. The system has to fit inside a 10-centimeter cube (or one liter) of space, about one-third of the total spacecraft. While thrusters of that size and even smaller exist, they do not have the capacity to push a spacecraft long distances. "If we wanted to try a mission like what we're proposing with current technology, we wouldn't even make it out of Earth orbit," said Longmier. "We have some little thrusters called gas jets that will push us a little bit, but what we want to do is be able to push our spacecraft millions of miles from Earth and go truly interplanetary." Second, Longmier's thruster uses a very different type of fuel – liquid iodine, or distilled water. Typically, plasma thrusters use a gas such as xenon or krypton. The use of a liquid propellant is necessary to store more fuel in a smaller space. The thruster will vaporize the iodine or water and then superheat it into a plasma state. A plasma is a gas that has been energized to the point that some of the electrons break free from their nuclei, allowing the ions and electrons to coexist. It is often referred to as the "fourth state" of matter. That plasma will then be directed through a "virtual nozzle" created with magnetic fields, pushing the spacecraft in the opposite direction. Longmier and Cutler are turning to the Kickstarter fundraising platform to get their interplanetary CubeSats into space fast. "The traditional funding process starts with some seed data, a large government grant and a large number of milestones and gates to go through. We'd like to leverage Kickstarter funds to compress that timeline and go from initial seed data to flight in about 18 months, a much faster time scale than is possible with traditional grants," said Longmier. The pair also cite the enthusiasm of "citizen explorers" as a major factor in turning to Kickstarter. They see the current push towards space entrepreneurship as an opportunity to get the average person involved and make space more accessible. "We really want to put the participatory experience in everyone's hands," Longmier said. "We'd like to open it up to the community and have people be a part of the process." Could plasma jet thrusters 'kickstart' interplanetary travel? If this works, can we get a kickstarter program to visit Ganymed, Titan, IO and Europa? Those are long overdue.